Kung Fu Clicker is the latest Idle clicker game for Android and iOS from the creators of Into The Dead 2 game. In Kung Fu Clicker game, you teach martial arts, karate to the students in the dojo. Everything is OK except the Shadow Fang Gang. They often visit your dojo and steal the money. You have to stop them by recruiting the martial arts masters in each room. And there are many cheats & tactics you can use to crush the gang. Kung Fu Clicker game also features rank mode in which you compete with other clans for rank points. In today’s post, we have covered everything about the game you need to know as a master: Kung Fu Clicker guide and Kung Fu Clicker cheats, tips & strategy to master the game. Before you dive into the Kung Fu Clicker cheats, tips & strategy guide part, let’s learn the basics first. In Kung Fu Clicker game, you run your own Dojo and train the students. As per the current version, there are four dojos in the game; Minimart, Sofa Sutra, Clean-Fu, and Ju-Dough Bakery. In each Dojo, there are many rooms such as a meditation room, kitchen, lockers, and more. You start with Minimart and earn money by training the students(automatic). Use the money in upgrading the rooms, buying more Dojo, leveling up the masters. In addition to the upgrades, leveling up, you have to protect the Dojo from the Shadow Fang Gang. They often raid your dojo and steal the money. If you don’t want to lose the money you made by teaching students, then you will have to crush them all at all cost before they reach the top floor(roof). To get rid of this problem, you recruit martial art masters or masters in each room. These master help you in crushing the enemies. And after a certain number of waves, their boss will arrive. So you should always be prepared for the fight. As you progress, a new feature or game mode gets unlocked; Showdown. In Showdown mode, you join a clan and battle against other clans. It’s like arena mode. In the battle, you raid other players’ dojo. If the raid goes successful, you earn lotus. Lotus crown(s) is one of the main in-game currencies in Kung Fu Clicker game. So this is the basic Kung Fu Clicker guide for the beginners. Now, let’s check out Kung Fu Clicker guide and after it, check out our Kung Fu Clicker cheats, tips & tricks to get victories in the raids. In this part, we will learn about the masters, Chi, transcend, showdown, raiders, and much more. Make sure to pay attention to all the parts to master this game. Masters are the main characters in Kung Fu Clicker game. You assign these masters to the rooms in the Dojo. There are two types of masters; melee and ranged. Melee type masters attack the raiders or other masters(in showdown mode) from close range. Ranged type master attack the raiders or other masters from a distance. On the main screen of the game, at the bottom-left corner, tap the scroll icon(master menu). There you can check the list of the master you have. Tapping on the master will give you more details; master type/range, attack speed, movement speed, and damage power. To assign a master, go to the Dojo -> tap the + icon next to room name. After it, choose a free master. To remove a master, go back to the Dojo, tap its icon next to the room name -> on the next screen, tap it again and choose to unassign. 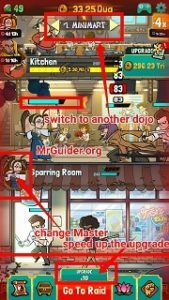 How To Get Masters In Kung Fu Clicker Game? How To Unlock New Masters? To access or get new masters, you need to buy a new dojo. Go to the room’s screen and at the top of the screen, tap the (>) icon to check out more Dojos. Buy it using the gold and get access to new masters. You can use duplicate master cards in leveling up. Sometimes, you get master cards from the chests(that you already own). These cards are used in leveling up a master. Go to the master menu -> just below the master’s icon, you can check the number of cars required to level up. Leveling up increases the HP(health), attack speed, damage, and movement speed of masters. And it also increases the master’s skill. Kung Fu Clicker game features celestial items. These items can increase the profit or money you earn from Dojo. For example; Infinity Specs is an item that can increase the profit by 16 times. You can upgrade these items further to get more benefits. How to get these items? There is another in-game currency; Chi. Chi is used in buying and upgrading Celestial items. How to get Chi in Kung Fu Clicker game? Use the transcend feature to get Chi. On the main screen of the game, at the bottom menu, tap the lotus icon or head to the transcend menu. There you can check the amount of Chi you will receive upon transcend. Hit the transcend button to confirm. But there is a catch. If you use this feature, you will lose all the progress; Dojo, rooms, room upgrades, and gold. But it does not reset the masters and celestial items. If you want to boost the income, then you need celestial items. And to get these items, you need Chi. And to earn Chi, you need to transcend. So yes! You should use it. Read the Kung Fu Clicker cheats, tips & strategy guide part below to learn how to use it wisely. Tap the Dojo button to go to the bottom of the center. There you will see the remaining time for the next raid. After it, a wave of enemies will raid your Dojo. To protect the gold from these looters, defeat them. All you need to do is assign the best masters in the rooms. You can also attack the enemies by tapping on them. If you defeat all the enemies, you will get the chest and from that chest, you can obtain master cards. You also earn a huge amount of gold. But if you failed to protect the Dojo, you will lose gold. After a set of waves, a boss with the enemies will raid your Dojo. So stay alert. In the fight, if the enemy has defeated the master, then they will take time to revive. You can instantly restore them using gems(not recommended). Or simply close the game for a few minutes. Because raiders come back again after a few minutes. And if the masters are not ready, then you will lose more gold. In the Showdown mode, you attack other player’s dojo and earn ranking points. As you gain more points, your rank will go up and on the basis of rank, you will get the reward at the end of the season. You can check the rank in my rank tab. Increase it by getting victories in the mode. Go there and tap the defense team button to set up the defense team. Other players can also attack your Dojo, so make sure to build the best defensive team. So this is the Kung Fu Clicker guide for the beginners. Now, let’s take a look at our top Kung Fu Clicker cheats, tips & tricks. You will deal more damage to the enemies when tapping the room(the room in which enemies are raiding). On the other hand, enemies take less damage when you tap on them. So if you want to deal more damage or crush the raiders fast, then tap the room. When a room reaches a milestone level(these levels include; 10, 25, 50, 100, and so on), you get a speed boost and tap damage boost. And it also increases the earnings. Tap Damage – The deal damage by you to the enemies by tapping the room/enemies. To increase the tap damage, upgrade the rooms and reach the milestone levels. 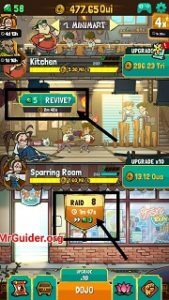 We would recommend you to unlock new rooms as fast as possible as you make more money from new rooms. In short, don’t stick with a room. In Kung Fu Clicker game, all the masters have unique skills. 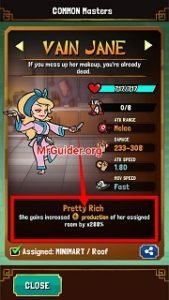 For example; Vain Jane is a martial art trainer and when you assign her in room, you make more money(+300% at level 5) because she has a skill; pretty rich. If you assign her in the room from which you are making the most money, you will get more benefit. Upgrading will boost up the stats as well as skill power. Similarly, Rei Yumi can increase the tap damage in her room. To check the skills of masters, head to the master menu -> tap on a master icon -> at the bottom of the master card details, you can check the skill info. In short, assign the masters on the basis of their skills. Assigning the masters on the basis of skill only helps in earning more. When defending the dojo from raiders, you should use a different strategy. If you have ranged masters, then assign them in the starting rooms. Ranged type masters can attack from a distance. On the other hand, melee type masters attack from the close range. Since raiders are slow in movement, ranged type units get the benefit as they can attack from a range. In showdown mode, you have to defeat all the masters to win the match. Prior to it, you have to select the masters. Make sure to include all types of masters in the team; ranged type, fast(movement), fast(attack speed), and melee. After it, you deploy the masters. Before you deploy, check the enemy’s formation. If your masters are on a high level, then there is no need of strategy. If not, then here’s how you can win in this mode; send the melee units(having high HP and medium movement) first and then send ranged units. Melee units will work as the defender and ranged units(these units are good at dealing damage) will take care of the damage. Using the transcend feature, you get Chi. For example; for the first time, you get 1000 Chi. Next time, make sure to use this feature when the amount goes over 1200-1500. Otherwise, you will not be able to progress fast. Spend Chi to upgrade the celestial items or buy new ones. Go to the showdown menu. Under the master deal section, you will see the master deals; if there is a master card you need, then grab the deal in exchange for lotus crown points. Check this section often as the deal changes every day. On the main screen of the game, at the top-right corner, tap the spin option. Watch the video ad to obtain the free boost offers. You will often see the pizza delivery boy near the Dojo(bottom). Tapping on it will give you free gold. Sometimes, you get free offers such as boost the tap damage, earnings, and more. Watch the video ad to claim the offer. For More Updates, Game News, Game Guides, New Game Releases, And Alerts – Like Us On Facebook – MrGuider, Follow Us On Twitter – @techhuntr. Check Out – Top New Android Games. Subscribe Us, Give your suggestions – here.